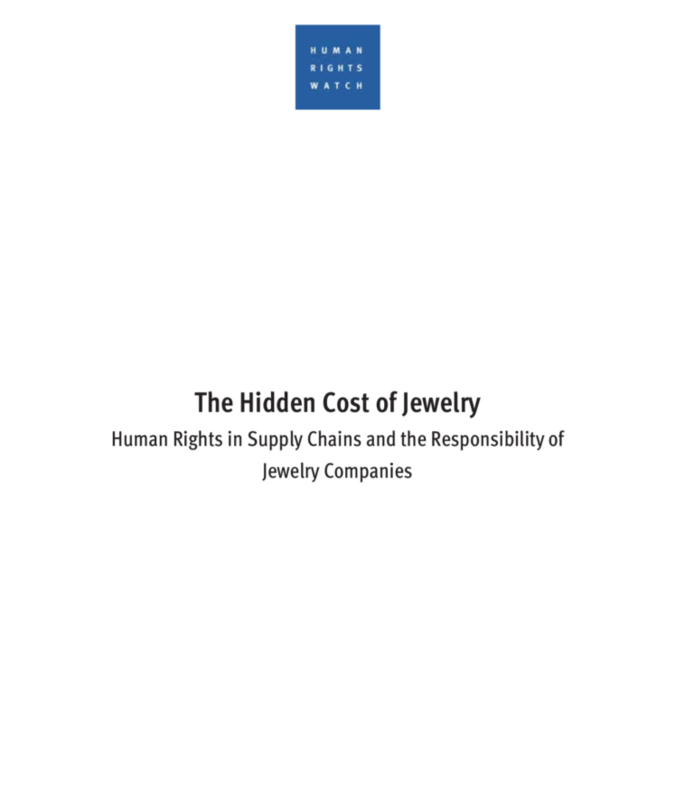 string(1255) "Resource Centre > Uncategorized > The Hidden Cost of Jewelry: Human Rights in Supply Chains and the Responsibility of Jewelry Companies"
In this report, Human Rights Watch scrutinizes steps taken by key actors within the jewelry industry to ensure that rights are respected in their gold and diamond supply chains. The report focuses on the policies and practices of 13 major jewelry brands, selected to include some of the industry’s largest and best-known jewelry and watch companies and to reflect different geographic markets: Boodles (United Kingdom), Bulgari (Italy), Cartier (France), Chopard (Switzerland), Christ (Germany), Harry Winston (United States), Kalyan (India), Pandora (Denmark), Rolex (Switzerland), Signet (United States-based parent company of Kay Jewelers and Zales in the US, Ernest Jones and H. Samuel in the UK, and other jewelers), Tanishq (India), Tribhovandas Bhimji Zaveri Ltd. (TBZ Ltd.)(India), and Tiffany and Co. (US). Collectively, these 13 companies are estimated to generate over $30 billion in annual revenue.